I’m so excited to be able to share the C.A.L.M.M Yoga Toolkit! A Yoga Curriculum/Toolkit for children of all abilities. This toolkit was designed with all children in mind, including children with ASD, ADD/ADHD, Down Syndrome, Prader-Willi, Cerebral Palsy, sensory processing challenges, language processing difficulties, cognitive and behavioral challenges, children with limited mobility and children with emotional challenges. This curriculum helps teach yoga poses, breathing strategies, body awareness, language skills, social skills and how to identify and cope with difficult or uncomfortable emotions. Chair yoga is included to make yoga accessible to children of all abilities. Included: Game/Choice deck 57 matching yoga cards/ 114 total (4 x 4) with game suggestion and instructions, 57 large print visuals (8.5 x 8.5), 55 instruction cards for yoga poses, breathing strategies, communicating/releasing difficult emotions and chair yoga (8.5 x 5) and 10 emotions cards (8.5 x 5). The cards are appropriate and interesting for all ages. Illustrations are unique, creative and one-of-a-kind. Total 236 cards. Plus 5 sets of lavender/left, red/right -I can feel C.A.L.M.M bracelets to support directional concepts and to remind children that they can feel CALMM if they practice their C.A.L.M.M strategies! Great step-by-step curriculum for helping children find their CALMM! There is nothing like this product on the market for teaching yoga, mindfulness and breathing to children. Hours of fun, breathing, communicating, socializing, stretching and much more! Read more about how I came to develop the C.A.L.M.M Yoga Toolkit in an article written by TIMES OF SAN DIEGO! You can purchase the Toolkit Here! Honored to have the opportunity to be a guest blogger on the Boost Breakfast blog for BOOST Collaborative! This organization is incredibly dedicated to enriching the lives of children through after school programs and are committed to changing the world for the better. Humbled to have the opportunity to work and collaborate with them! Yoga as a strategy for improving behavior has been a tool I have been using for several years and have seen an incredible impact it has had on the emotional health, well-being and behavior of the children I have worked with. Take a peek at some suggestions for incorporating yoga as a strategy for improving behavior! Excited and honored to be featured on KIT – Kids Included Together blog!! Asanas for Autism and Special needs will be collaborating with KIT in the near future. Stay tuned! Karla is an 18 year old girl with autism. She began as my student when she was 13 years old back in 2009. She came to my classroom because she was struggling in her placement and required more behavioral supports and structure in order to participate in school activities. I was a new teacher to the school and she was my only student for the first 2 weeks. Karla and I got to know each other very well over those 2 weeks. She had significant behaviors when she started in my class. She would scream, tantrum, hide under desks, run away and would often hit herself when she was frustrated or upset. It was easy to identify that behind her behaviors was an intent to communicate. She wanted and needed to communicate her feelings, thoughts and ideas as well as her needs but just did not know how. Over the years, with visual supports, social stories, structured language instruction, modeling and positive behavior programming Karla came a long way but still struggled with being able to reciprocate or initiate conversation with others. When asked a question her common response would be a frustrated “I don’t know!” I used many social stories with Karla, particularly to work through challenging situations or to front load upcoming changes in her schedule or routine. She would read the social stories and often times they would help her calm down. She would ask to bring her social stories home with her. The words on the pages gave her comfort and by reading them rather than listening to someone talk, she was more able to process the meaning behind the words. Karla had significant delays in receptive language so processing verbal language was very difficult for her. It’s as if the words would come out of people’s mouths and float into space. When they were written down they were permanent and she could read over as many times necessary in order to understand. One day in class, I noticed Karla was typing something on her computer. Come to find out she was typing herself a social story!! She had been nervous about her bus getting home late. I had created a social story to help her be ok with the bus arriving late because of traffic or other circumstances. In her social story she typed words and “mantras” like “everything is ok”, “if my bus is late I can be flexible”. This became an ongoing occurrence. She would type social stories about when she was happy and when she was upset. I wanted to teach Karla how to have a reciprocal conversation and she had given me a great idea! I created an e-mail account for Karla and taught her how to use her e-mail to e-mail her parents. The idea was that her parents would e-mail her and ask her a question, she would check her e-mail and answer their question, then ask them a question. We practiced this for a while. She needed prompting and visual supports to complete the communication task but was independent with accessing and using her e-mail. One day she came to me and said “Ms.Thornton your e-mail?” I asked, “Do you want my e-mail address?” , Her response was, “Yes. Please.” I added my e-mail address to her address book in her e-mail account not knowing what incredible things would happen next. Karla began to e-mail me every day. She started off with a sentence or two. Over the span of a year, she e-mails me multiple paragraphs, conveys her thoughts ideas and emotions, answers questions and has a full on reciprocal and ongoing conversation with me! We have become pen pals. Since then, we are no longer together, in person anyway, but we are connected through her chosen language and way of communicating. Typing words back and forth has proven to be her language, her means of expression. Just last week I received a letter in the mail. It was a letter from Karla. I was beaming with excitement to receive it. Her e-mails and communication with me have become a highlight in my days. I reflect on where she was and where she is now and feel a tremendous sense of pride and appreciation for her and all that she has given to me. It’s remembering that our purpose in working with such incredible individuals is meeting them where they are and speaking their language rather than expecting them to meet us where we are. Much love and gratitude to you Karla, my pen pal, my teacher and my friend. See more about my yogi friend Karla and her gift for drawing in Karla’s Page on my website Yoga by Shawnee and visit the page about Autism and the benefits of yoga for children with autism and special needs. I have been doing private yoga sessions with a 25 year girl with Autism. On her first visit to yoga she brought her Sponge Bob stuffed animal. When I think of my own experiences with stuffed animals as a child, I remember the softness and familiarity, even the smell of them as giving me comfort through the night and in essence providing me with a sense of safety and support. In my last session with her she brought her Hello Kitty. She has a familiar pattern to her sessions. At first meeting she clings to her stuffed animal and begins to express her thoughts, most often repetitive worries or happenings in her day. I’ll take my shoes off and she will proceed take her shoes off and place them neatly under the bench. I’ll let her know that her mat is ready for her and she will sit down with her stuffed animal still clutched in her hands. 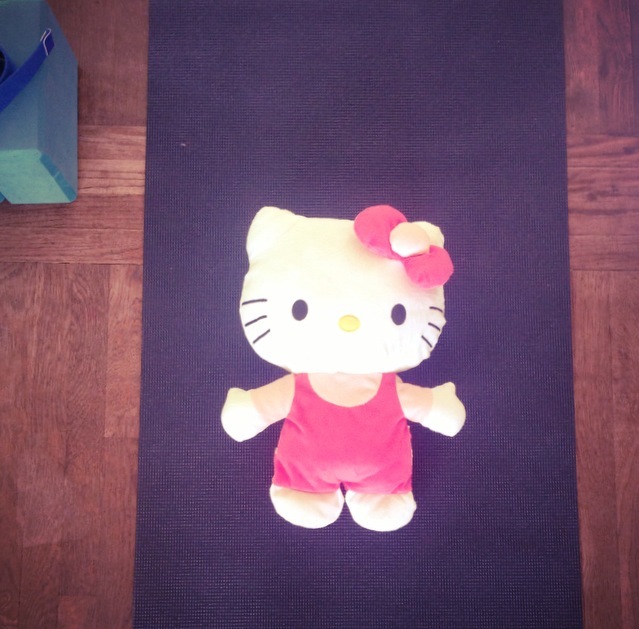 As we begin yoga I will ask her if she wants Hello Kitty to sit next to her or if she would like mom to hold Hello Kitty. Most often mom is chosen as the watcher of her beloved stuffed animal. When we first begin her session she wants to share and repeats thoughts that seem to play over in her mind like a record player. I am able to capture her attention with images and modeling and we begin the session with belly breathing. As I breathe in and out audibly she follows my lead. In each session there has been an ebb and flow of showing attentiveness then displaying feelings of anxiety, repetitive thoughts, expression of anger, worry or frustration. Patiently I stay engaged and calm and as she displays her anxiety and expresses her worried thoughts, I breathe in and out audibly. The poses that have the most impact are the restorative poses with soft blankets and bolsters to provide her with that sense of comfort and support she gets from her stuffed animals. Even when there are times of hesitation or frustration in moving into a pose when she finally gets there I can see an automatic sense of calm that comes over her. She may continue to repeat worries and thoughts but the more I breathe audibly in and out, exhaling each breath with a haaaaaaa sound, her repetitive talk diminishes and she begins to soften, repeating the haaaaaa following my breath. With each haaaaaa sound, I can see her soften a bit more. Every session I have observed her come to a place of complete CALM. As she lies in her pose, now even more open to receive, I express to her how calm she looks, that this pose she is in helps her FEEL calm. So many individuals with Autism struggle with extreme anxiety and have difficulty knowing what calm looks like and even more difficulty knowing what it is to feel calm. It is my hope through her practice of yoga that she is able to feel a sense of support, a sense of grounding. It is my hope that she will learn to use the tools from yoga to help her cope with anxiety and when she is in need of support and comfort, she will turn to her mat, her blankets, her bolsters and her breath so she may know what is is to experience a more peaceful life and so she may know what it is to truly FEEL calm. In Gratitude to the many lessons learned from beautiful teachers like her. Yoga as a Strategy for Improving Behavior? There are many strategies used for improving behavior in children with autism and special needs; including visual aides to foster communication and understanding, sensory activities to support sensory needs and token/reward systems to increase desired behaviors and decrease undesired behaviors. These strategies, if implemented consistently can be highly effective. Teaching yoga, physical poses, breathing and visualization can also be an effective way to improve behavior of children with special needs in the home and school setting. The physical postures (asanas) support sensory regulation, which directly affects emotional and behavioral regulation. The poses along with breathing help children develop focus, concentration and in many cases impulse control. Breathing strategies (pranayama), support children in calming their nervous systems, releasing tension and stress in the body as well as releasing difficult or uncomfortable emotions. A study about Yoga and Improving Behavior was recently published in the American Journal of Occupational Therapy. The results of the study showed improvement of behaviors in the children with autism who practiced yoga consistently over a 16 week period. When children are calmer and have coping skills to manage difficult emotions such as anger, frustration and anxiety they are more likely to exhibit less behaviors. Implementing yoga in the home and school setting as a behavior management strategy can be tremendously effective in creating a calmer, more peaceful environment as well as calmer, more peaceful children. Why wouldn’t we want to make this a part of our children’s experience and lives? Strategies on implementing yoga in the home and school environment in an upcoming post. Stay tuned!